Welcome to Kid Konnection -- a (hopefully) regular weekend feature about anything related to children's books. Today, I am going to feature a middle-grade book that I recently read and really enjoyed. Summary: After one summer at the Little Tykes Theatre, Mia Fullerton is meek no more, but that doesn t make her life any easier not in her sophomore year at St. Hilary's, when her best friend Lisa forces her into a dangerously big part in The Music Man. Not when her ex-boyfriend, Tim, is teaching her little brother Chris to treat women like objects. And not when she learns to drive with serious repercussions. Who is Mia? Is she an independent girl like Zoe, her acerbic goth friend from Little Tykes? She d like to be that s why she's volunteering to be onstage for the first time, in a show populated by her first ex and childhood crush Jake, her arch-nemesis Cassie, and new girl in town Alyssa. That s why it's so important she overcome the bizarre driving instruction of St. Hilary's janitor Mr. Corrigan to earn her driver s license, and therefore her freedom. Or is she the girl who misses Tim, even after the way he betrayed her? Tim is smart, funny, and likeable in a distinctly obnoxious way, and he s determined to win Mia back even if he has a funny way of doing so, dating both Cassie and Alyssa at the same time, behind both their backs. Can Mia forgive Tim? Should she instead choose Eric, Zoe's cousin, a nicer and more respectful choice in every way? Or would either choice defeat her goals of independence? I usually don't read series books out of order, but I made an exception for MIA THE MAGNIFICENT by Eileen Boggess. MIA the MAGNIFICENT is the third book in The Mia Fullerton Series, but I promise that I had no problem starting the series with book three. (Of course, it was a middle-grade book so that probably helped!) I enjoyed this book so much that I'm very anxious to go back and read the first two (MIA THE MEEK and MIA THE MELODRAMATIC) now. I thought this book was so cute! Mia is a terrific character and I thought she had a great sense of humor. I especially enjoyed the back-and-forth banter she shared with her "ex-boyfriend" Tim. It was pretty clear to me that Mia has changed (and matured) throughout the series of books because there were some references to her past behavior. But I thought she was a realistic example of a normal teen-age girl. She had issues with learning to drive, ex-boyfriends, current boyfriends and school. I think young girls will just love her antics! So many scenes in this book were very funny -- not in the outrageous sense, but in the real-world sense. Funny things happen to teenagers all the time, and I think Ms. Boggess has a great ability to turn ordinary situations into hilarious ones. Even though I am far removed from my teenage years, I still related to Mia and her actions. I liked how she handled adversity and bounced back from it, and I found myself cheering her on throughout the story! MIA THE MAGNIFICENT is just the type of book that I'm pretty sure my daughter and her friends will love. While my daughter is only ten years old, Mia and her friends are already in high school -- but the book is geared towards a middle-grade audience. I know that Booking Daughter likes to read about older girls and their "issues;" and as a mom, I like that this book is clean enough for her to read. Thanks to Bancroft Press for sending me a review copy of this book. 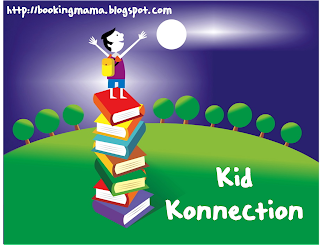 If you'd like to participate in Kid Konnection and share a post about anything related to children's books, please leave a comments as well as a link below with your name/blog name and the title of the book! Feel free to grab the little button too! Mia sounds like a great character! I'm excited because I'll be participating in this next weekend! I left a link to the book I reviewed this week for children on slavery called The Watchers by Gloria Whelan (in particular, what it entailed for little children). I think my younger daughter would like MIA and her adventures; we'll look for this one. My link is to 14 COWS FOR AMERICA, an incredible story about compassion and empathy. Very cute! I have some posts to link up in the next few weeks. This is a great feature. I always seem to learn about a new title or series here. Thanks for sharing!